What effects do space and time have on classroom management, discipline, and regulation? How do teachers' practices create schooled and literate students? 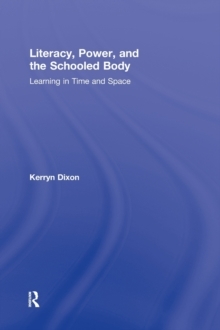 To explore these questions, this book looks at early childhood classrooms, charting the shifts and continuities as four-year-old children begin preschool, move from preschool into primary school, and come to the end of the first phase of schooling at nine years. The literacy classroom is used as a specific site in which to examine how children's bodies are disciplined to become literate. This is not a book that theorizes space, time, discipline, bodies, and literacy in abstract ways. Rather, working from a Foucaultian premise that discipline is directed onto children's bodies, it moves from theory to practice. Photographs, lesson transcripts, interviews, and children's work show how teachers' practices are enacted on children's bodies in time and space. In this way, teachers are offered practical examples from which to think about their own classrooms and classroom practice, and to reflect on what works, why it works, and what can be changed.